When my siblings and I were growing up in Occoquan, we often visited “The Dam”. Back in those days, the Fairfax County Water Authority let people in through their entrance near the Millhouse Museum. We’d fish back there, ride bikes back there, talk about episodes of Lassie and Star Trek with our babysitter, Jessica. I even learned an unfortunate but necessary lesson about momentum when I jumped off a skateboard that was rapidly descending a hill. There are a lot of memories back there. Unfortunately, in my adult years, the access to the Water Authority property has been cut off…even to those sporting a pregnancy belly and who ask really, really nicely. That means we can no longer stroll along that particular memory lane. Columbus was trying to discover a trading route to the East Indies when he ran across this continent. Similiarly, Sagan and I were trying to find an alternate walking route to the local CVS Pharmacy when at dusk, I spied a paved path to our right. In the distance I could hear the muted roar of running water. 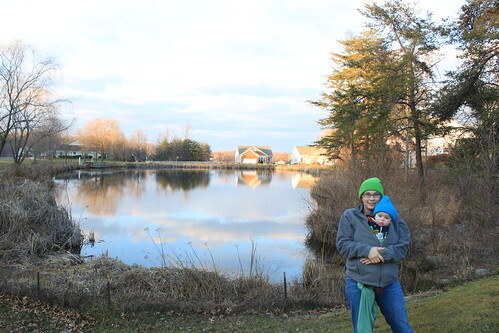 Light was scarce, so we couldn’t check it out that night, but it wasn’t long before it was “Family Walk” time. Instead of our usual route, we walked that path. 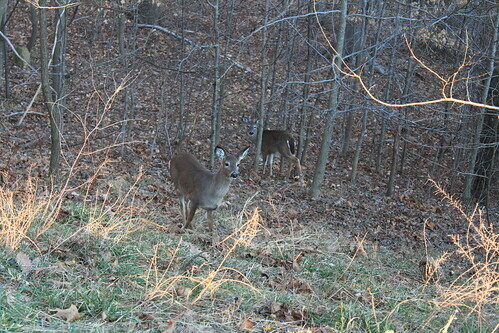 It transversed the hillside ABOVE the Fairfax County Water Authority property. From our vantage point, we could see the old road my siblings and I used to frequent. 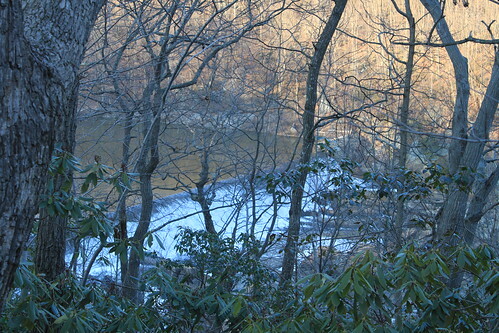 We could also see the lower dam. We didn’t get to see the upper dam, but we did get to see a number of white tail deer and beautiful Lake Michael. I would still jump at the chance to revisit our childhood route. In the abscence of that, this walking trail was quite satisfying. Perhaps one day Sagan can ride his tricycle there. Hopefully he won’t have to learn about momentum the hard way like his mommy did. Speaking of interviews, the proprietor of NationalRVParks.com had some questions of his own about this blog. I fielded questions on how I started blogging, the benefits I’ve gotten from it, favorite Appalachian Trail camping experiences…and what celebrity I would most like to hike the Appalachian Trail with. Click on the image below to read the full interview. Interview with The Moon of My Mind Author J.J. Kalke, Jr. In the middle of the night when I have been on milk duty, I have found my Kindle to be a pretty steadfast companion. Recently I finished The Moon of My Mind, the first of three books that follow the struggles of a claustrophobic teenager who lives on the moon. In the late 21st century, growing up on the moon is a nightmare for Dennis Howard – considering his claustrophobia and the underground cities that make up Luna. But thanks to SIM technology, Dennis can keep his sanity by entering simulated realms both vast and rich with complexity. Though full of adventure and peril, in the SIM he finds his sanctuary. Such retreats are short-lived for back in the real world, after a bombing that nearly kills his father, Dennis and his friends find themselves embroiled in conspiracies and intrigue that may well decide the fate of everyone on Luna. The author of the book, J.J. Kalke Jr., was kind enough to answer some questions. We talked about background, inspiration, the movie Inception…and maybe a little bit about trees as well. Enjoy! I didn’t see an About the Author included with your book. In the novel, you see snippets of knowledge from a myriad of subjects – engineering, computer technology, biology, psychology and even music history. I was curious what your schooling and professional background is. By day, I’m a mild-mannered software architect. (At night, pretty much the same.) I graduated from Purdue University with a bachelor’s in aerospace engineering. I later got a master’s in computer systems engineering from the University of Pennsylvania. But that’s just my formal education. The informal kind never really stops. I’ve worked for financial institutions on banking software as well as aerospace firms to help put all manner of satellites into space. On Facebook you mentioned this series has been “a long time coming.” How long have you been working on the Persistent Illusion series? The first words for The Moon of My Mind, book 1 of Persistent Illusion, were set down on paper back in 1991. Now, that’s a long time ago, and I didn’t put in twenty person-years of effort. Thankfully, life has been very busy, and when I had time to write, I did. That being said, Persistent Illusion is a complex piece of work. I hope it comes off as effortless, but it is one of the most difficult things I’ve ever done. I wanted to do something that I’d never seen done before. We’ve all seen stories with multiple plot lines that merge at the end, or sets of characters whose lives begin separate but later intermingle in unexpectant ways. I wanted to take the form one step farther: to combine a novel, a novella and a handful of short stories in such a way as to keep them distinct and separate while simultaneously making them magically culminate together. Your book takes place on the moon. However, the main character escapes his claustrophobia by immersing himself in virtual worlds through the miracle of SIM Technology. As a result, your story gets to alternate between elements of science fiction and fantasy. As a reader, are you equally fond of both genres? Which works have you found particularly influential? It’s true, I love both genres. Of course, I didn’t come up with the SIM myself. If memory serves, I first encountered the concept in James P. Hogan’s ‘Inherit the Stars‘ (his Giants series). It may seem obvious now that this type of technology is where we are headed, but this book was published in 1985. There are lots of examples in TV and movies. Anyone remember the TV series ‘Earth 2‘ from back in 1995? Everyone had VR gear. How about the movie ‘The Thirteenth Floor‘ (1999)? Avatar, The Matrix, etc. All of these used the SIM technology either as something tangential to the plot or the entire story was merely about the SIM. In Persistent Illusion, I attempted to use it, not as a focus, but as a means. What am I talking about? Let’s say the SIM is a metaphorical car. The story isn’t about the car, nor is it just a nifty device that you happen to use to get across town. Instead I created a plot in which you can’t get here from there unless you have the car. The concept of bouncing back and forth between worlds or time periods isn’t new either. ‘Lost‘ took it to another whole level. But go back and look at the movie Highlander (1986). I loved the contrast set up between the expansive past and the hard painful present. The current show, ‘Once Upon a Time’ is doing largely the same. What’s so appealing? The change- the switching of gears- is jarring enough to wake you out of your complacency. Keep in mind the human senses are best at detecting change. (Just try staring at an unchanging scene without moving your eyes. It doesn’t take too long before the entire scene vanishes as you go blind- move your eyes and it’s back.) By shifting gears between the two genres I had hoped to achieve a jolt to your senses and thus make you see and taste the action all the better. You make use of a handful of Public Domain poetry in your first book. In a Native American-inspired SIM adventure, for example, you include a 15th century Nahua poem. Have any of the poems inspired scenes in your book? Poetry is like cinnamon. By that I mean poetry can invoke powerful emotions without many words just like the spice has a powerful influence (and makes everything taste better). I included poetry in certain places to establish mood or provide emotional closure, for riddles, songs and prophecies. Of those appearing in all three books, I wrote about half and I borrowed the rest. I would have written the whole thing in poetry if I could have, but I’m not that talented. (Shakespeare – wow). But to your question: no, the poems didn’t actually inspire any scenes. In fact, it was a bit the opposite. Via some mysterious process I fail to understand, I would write a piece, figure out I needed a poem, then soon afterwards I’d run across a poem that said exactly what I needed. I sometimes felt as if I must be getting some help. That didn’t bother me as much as Dicaprio’s character saying, “Here’s my totem. Never tell anyone how you totem works. Got it? Great. Now let me tell you how mine works.” But we needed to find out how they worked somehow, so Nolan used the concept of a reflection character – someone who can be told the information we (the audience) need to have. Couldn’t he have used a voice over? No, I was much more upset by The Matrix (1999) that not only delved into the SIM world concept, but some other aspects that enter my book as well. I love that movie. Some of the things that really grabbed me are the small details you threw in about life on the moon. For example, early on you describe how architects used elevators in the lunar buildings out of habit. I absolutely love that concept of “vestigial architecture”. Another example is the bright colors people would wear to offset the monotonous color scheme of lunar life. Are these details things that came to you as you were actively writing or were you out and about one day waiting for an elevator (or seeing someone in a bright wardrobe) when the notion struck you? Most of those details were invented as I wrote, however the elevator is another story. Generally speaking, in the low gravity of the Moon, people shouldn’t need elevators unless they have a couple of broken legs. Yet the elevator was a device I needed for the plot, so I decided to explain it, from Dennis’ fourteen year old perspective, as silly architectural concepts brought from Earth. There really are some good reasons you would need an elevator, but Dennis sees his city as a place where you can fly. Why get into a tiny box when you can leap up or down stairwells two floors at a time? Finally– I’m passionate about trees and I was pleasantly surprised that here I was reading a book about the moon and seeing how often trees were mentioned and not just in the virtual worlds! I believe I recall oaks, maples and larches making appearances. What is your personal favorite type of tree? Trees – and nature in general- are a vital part of all the lunar cities in Persistent Illusion. Here in the real world, we’ve already managed to cut ourselves off from nature. Imagine what it would be like for people on the Moon. The connection with nature would be a means of keeping everyone from going stir crazy. In the book, the cities were designed and constructed well before they had perfected SIM technology. Dennis stays grounded by immersing himself in nature via simulations instead of the arboretums dotting the city. The older and larger the tree, the more I love them. Sequoias. They dwarf us in both size and life-span. It gives you some perspective, something impossible to keep for very long. The Moon of My Mind, Whispers of Memories Lost and Greater Than I Know make up the Persistent Illusion: A Distant Ringing series. All three books are available for the Kindle on Amazon.com. 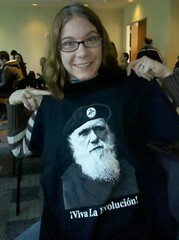 A lovely Darwin Day 2012 to you! A couple of years ago, I accompanied Ryan Somma to the then-new Sant Ocean Hall at the Smithsonian National Museum of Natural History. Although I was already a subscriber to evolution at the time, I profoundedly struck by the fossil record leading up to whales. Starting with the land-based Maiacetus inuus you could watch the progression of millions of years unfold right before your eyes. The front legs got larger and broader and the hind legs got smaller and smaller. Finally you were presented with the bones of a modern day whale. If you watch the film Big Miracle, you’ll note that whales no longer have hind legs, but inside they still carry a souvenir of old times – hip bones! The progression was easy to see and remarkably beautiful. I remember feeling so impressed and inspired. In celebration of Darwin’s Birthday today, Ryan has compiled a list of 101 Reasons Why Evolution Is True. Perhaps there will be something on this list that will you’ll find as inspiring and fascinating as I was by whale hip bones! One thing I am more aware of thanks to Ryan is the error-correction mechanism that is in place in science. “Science is a self-correcting algorithm,” Ryan likes to say. He points out examples where new findings trump old ones, conclusions are refined and how sometimes planets we know and love suddenly become dwarf planets (a correction Ryan happens to disagree with). He also shares tales such as Larry Taylor. Forty years after vowing to “eat his shorts” if water was ever found on the moon, he had to do just that (albeit in tasty cake form). One morning recently, I woke up and shuffled into the bathroom. I was greeted by my reflection. Even though I was wearing a scrunchie, most of my hair had escaped it. The free strands were the exact opposite of a school of fish. Each had its own unique idea of what direction to go in. My roots were grey. My eyes were puffy and pink. “I look like a frazzled first-time Mom,” I announced. “No, you’re beautiful.” Ryan tiredly recited an old conclusion. The new data before him was indisputable. Just like that, he corrected his error. I absolutely love how one of Ryan’s favorite facets of science is something he practices himself!